One of the all-time classic effects in Photoshop is the burnt edge, and there's lots of different ways to create it, but in this Adobe Photoshop tutorial, we're going to look at a way that's not only easy, it's also extremely flexible. We'll be using a Curves adjustment layer to create the initial effect, and then we'll see how easy it is to fine-tune it and create different variations. 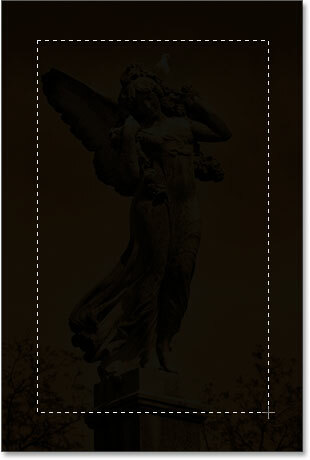 Finally, we'll see how to easily add the finished effect to other photos without having to redo anything. 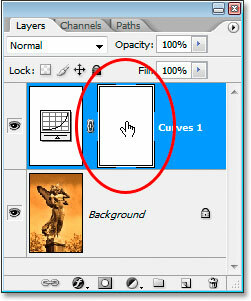 Select "Curves" from the list of adjustment layers. 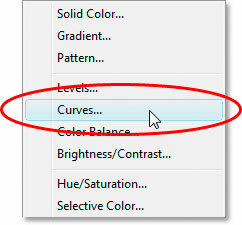 The "Curves" dialog box in Photoshop. All we're going to be doing is moving it, and we'll do that next. Drag the white point marker straight down until the "Output" reads somewhere between 10 and 20. The image now appears darkened almost to solid black. Select the "Rectangular Marquee Tool". 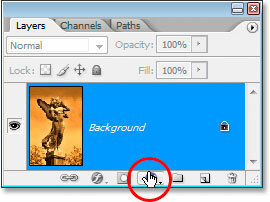 Drag out a selection inside the image to create a border area around the edges. Click on the Curves layer mask thumbnail to select it in the Layers palette. Only the border area around the edges is now affected by the Curves adjustment layer. The layer mask thumbnail now appears black in the center with a white border around it. Use the slider bar at the bottom to adjust the blurring amount and soften the border edges. The dark edges now softened. Resize the edges around the image if needed by resizing the layer mask with the "Free Transform" command. Hold down Shift+Alt (Win) / Shift+Option (Mac) while dragging any of the corner handles to resize the mask from the center and maintain the same proportions. Lower the opacity of the Curves adjustment layer to lighten the edges if needed. The edge darkening is now more subtle. We'll look at a couple of other easy variations on the effect next. The Curves adjustment layer set to the "Overlay" blend mode. The edges now have dark, saturated colors. 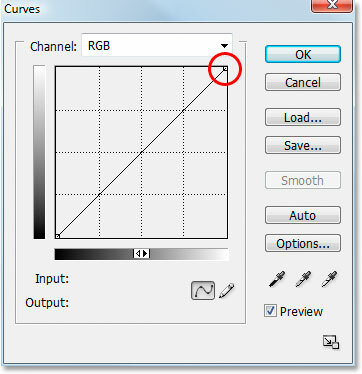 The Curves adjustment layer set to the "Color" blend mode. The edges are now black and white, with the color fading in towards the center. 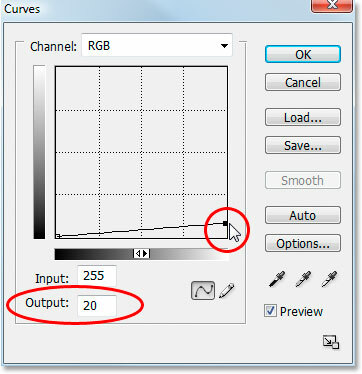 Finally, let's see how to now use this Curves adjustment layer to quickly add the exact same effect to a different photo. We'll do that next. 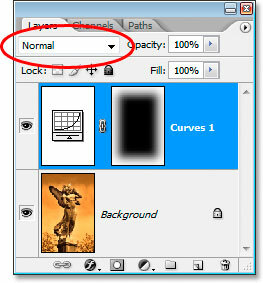 The layer blend mode is now set back to "Normal". 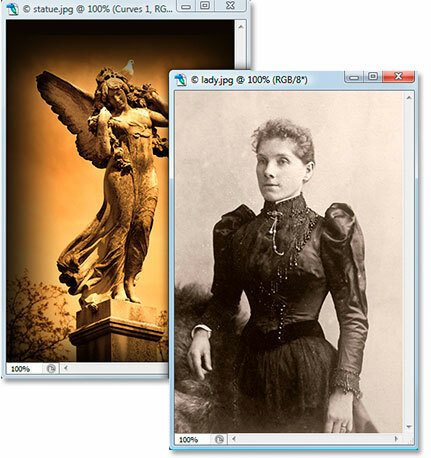 A second image now opened on the screen along with the original. 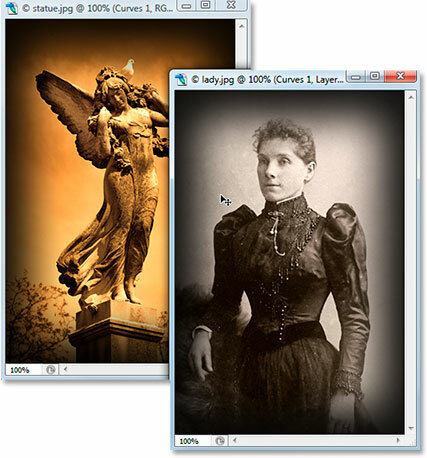 With both images open, drag the Curves adjustment layer from the original image onto the second one. And instantly, the effect is recreated on the second image with no effort at all. 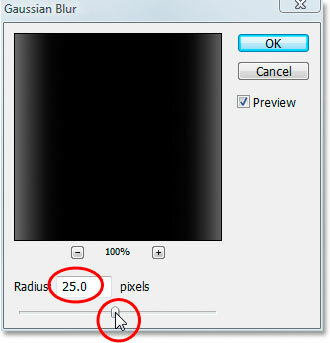 You can then change the blend mode, resize the layer mask or lower the opacity to your liking. 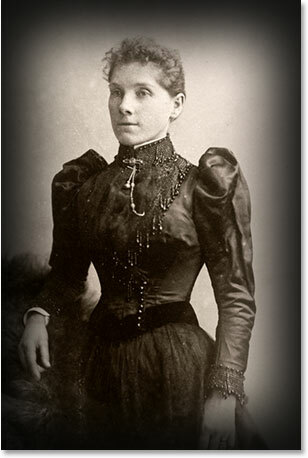 The effect is instantly added to the second image. And there have it! 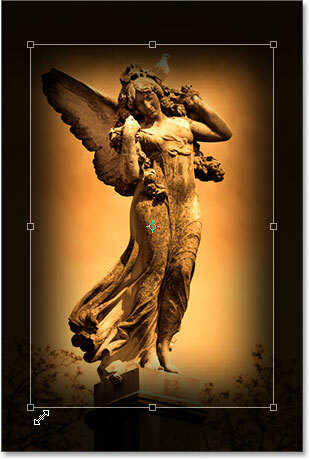 That's how easy it is to create this classic "burnt-in edge" effect in Photoshop, fine-tune it, create different variations using different layer blend modes, and then add the same effect to another image instantly. Check out our Photo Effects section for more Photoshop effects tutorials!